Few people know that Memphis International Airport (MEM) is the busiest cargo airport in North America and the second-busiest in the world. FedEx alone flies approximately 400 flights per day that deliver 180,000 packages. UPS is expanding its presence here; soon the company will have a campus so big it can sort almost 60,000 packages per hour. But for human passengers, the airport is quite manageable. There are four runways that served around 4 million people in 2018. All the major airlines fly through the airport including American, Delta, Air Canada, Southwest, Frontier, and United. Vacation Airlines and Via Airlines also have a presence. While Memphis used to be a hub for Northwest Airlines and had many direct flights to destinations, many flights now have to connect through another airport. The Memphis Airport is divided into three concourses A, B, and C. While you will check into your flight and go through security in your assigned concourse, all of them meet together after security. That means all the restaurants, bars, and shops are easily accessible for all. The airport is usually calm, but it can get busy during peak times. After you check your baggage in (or if you are only carrying on possessions) feel free to head to the security station in a different concourse if yours has too long of a line. MEM is friendly, safe, and offers a variety of amenities for different kinds of flyers. There is a family restroom and a pet relief area just after security in the B terminal. The airport has a team of volunteers named the Blue Suede Service who offer local knowledge and aviation expertise. If you have a question about where to find a certain souvenir or which baggage claim is yours look for the people in navy blue vests, white shirts, khaki pants or shorts, and clip boards. 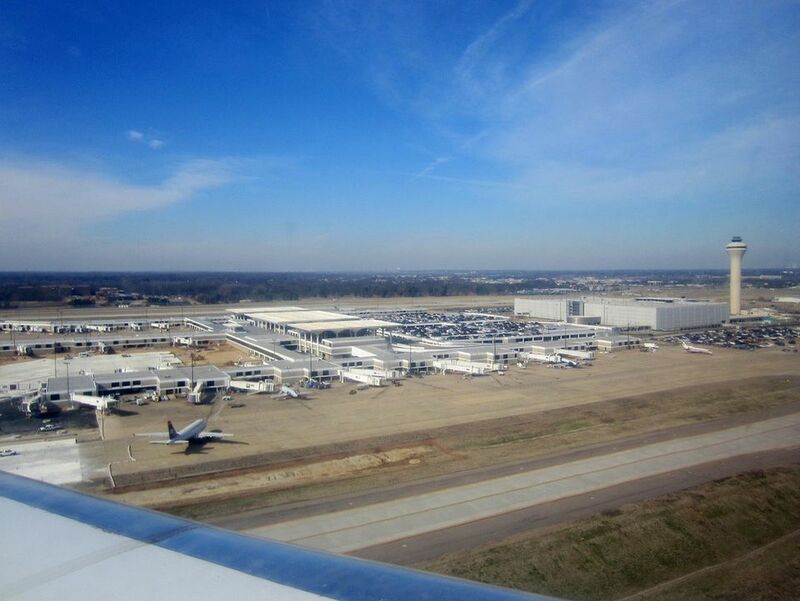 Memphis International Airport offers both short-term and long-term parking options in two covered facilities. The parking garages are well lit, and there is even a service for car trouble (The airport claims it jumpstarted more than 1,000 vehicles in 2018 and helped more than 1,500 travelers find their cars.) There are free luggage carts available by the elevator in each level of the garage. The airport has 134 accessible parking spaces. You may pay with cash, debit, or any major credit card. Economy parking: $6 a day. It's free for under 30 minutes. Long term parking: $15 a day. Memphis International Airport is located at 2491 Winchester Road, Suite 113, Memphis, TN 38116. It can be reached via I-240W. Take exit 23B for Airways Blvd S toward International Airport. From there you can follow the clear signs for the airport. You may encounter some traffic at rush hour both in the morning and the evening commute, but even that is minimal compared to other cities. There are bus services that will take you to the airport, but they aren't direct or widely used. Memphis has taxi companies. You should call ahead to make a reservation. The easiest option is to use Uber. Uber is widely accessed and used in the city. For a true Memphis feast, head to Neely's Interstate Bar-B-Que. This local BBQ joint has jump pork sandwiches, ribs, sausage, and more. It's near gate C7. To try craft beer from around the South head to Blue Moon Tap Room located at C1. The food isn't bad either. If you're traveling in the morning and want a sweet breakfast look no further than Cinnabon Baked to Go located at gate C14. This gooey Memphis favorite will make sure you start your day off right. There is a Starbucks in every concourse to fulfill your coffee dreams and needs. The easiest one to find is outside Concourse B security - it's where all the terminals connect. Also at the connector is Urban Market, a gourmet kiosk where you can get sandwiches, salads, and snacks to go. Many of these options are healthy. If you want a top-tier loaded sandwich head to Lenny's Sub Shop near gate A23. They'll put everything you want on your sandwich from spicy peppers to six kinds of condiments. The best place to head for snacks, magazines, or a new book to read on the plane is River City News & Gifts. They also have an extensive collection of Memphis souvenirs and gifts if you forgot a present. There is one near A29, A23, C12, and just outside security checkpoint B where the terminals connect. If golf is your love you're in luck; there is a PGA Tour Shop in the airport just outside security checkpoint B. You'll find clothes, accessories, and other products. If you left your charger in the hotel room head to the BestBuy Express vending machine where you can buy a new one and other high-end electronics. It's located near the Delta Sky Lounge in C Connector. The only lounge in the airport is the Delta Sky Lounge. Inside you'll find alcoholic and nonalcoholic beverages, snacks, wifi, and screens to watch television. The lounge is adjacent to the B Security Checkpoint in the B/C Connector. You can get in if you're a business class travel or have a membership through Delta. When space is available the lounge accepts guests at the door as long as you have a Delta Airlines boarding pass. A single visit is US$59 per person. The airport has free Wifi. All you have to do is watch an ad, and you can browse online as long as you want. There are also outlets and charging stations scattered throughout the airport. Many seats have poles in the middle with outlets so you can charge all your appliances at once. Inside the airport is a historical marker commemorating the final flight of Dr. Martin Luther Jr. The civil rights leader arrived the morning of April 3, 1968 on Eastern Airlines Flight 381. Later that day he delivered his "I've Been to the Mountaintop" sermon. MEM has an arts program so travelers can view local art during their time in the airport. There are one-hour performances by the Memphis Symphony Orchestra, a rotating exhibit of local paintings in concourse connectors, and more. Check the schedule here. MEM has a partnership with Memphis' NBA team, The Grizzlies. The airport regularly holds raffles so travelers can win tickets to see the action live. The airport has a free lounge for active members of the U.S. Military and their family. It's located next to gate A27. If you need some peace and quiet look no further than the meditation room. There are also mother's nursing rooms in every concourse.